Ischia (Italy) (AFP) – G7 countries and tech giants including Google, Facebook and Twitter on Friday agreed to work together to block the dissemination of Islamist extremism over the internet. The acting U.S. Homeland Security Secretary Elaine Duke has called on Silicon Valley to remove extremist content, Reuters reported. The United States and Britain are set to push social media firms to deal with the problem at a G7 meeting of interior ministers this week, Duke told reporters in London where she had been meeting British Home Secretary (interior minister), Amber Rudd. Now that the pipeline is operational and already leaking, internal documents obtained by The Intercept and reported on Saturday reveal the deep collusion between local police forces, the pipeline company, and defense contractors as they executed “military-style counterterrorism measures” to suppress the water protectors. TigerSwan, described as a “shadowy international mercenary and security firm” that “originated as a U.S. military and State Department contractor helping to execute the global war on terror,” was hired by Energy Transfer Partners to spearhead “a multifaceted private security operation characterized by sweeping and invasive surveillance of protesters,” The Intercept wrote. Reportedly, one of TigerSwan’s contractors leaked 100 internal documents to reporters Alleen Brown, Will Parrish, and Alice Speri, who were able to assemble roughly 1,000 more via public records requests. In some cases, persons “of interest” were even tracked when they crossed over state lines. What’s more, the documents obtained via open records requests include “communications among agents from the FBI, the Department of Homeland Security, the U.S. Justice Department, the Marshals Service, and the Bureau of Indian Affairs, as well as state and local police,” that reveals interagency collusion and information sharing on the anti-DAPL protesters. Last week MintPress News reported al-Nusra has rebranded itself as Hay’at Tahrir al-Sham and by doing so is no longer on the U.S. terror watchlist. This frees up the most effective jihadist “rebel” group in Syria to continue the CIA instigated war against Bashar al-Assad’s government. Virginia Democrat Sen. Tim Kaine and Arizona Republican Sen. Jeff Flake are trying once again to get Congress to debate and vote on authorizing military action against ISIS. The senators on Thursday unveiled a new Authorization for Use of Military Force against ISIS, al Qaeda and the Taliban, their second attempt to prod their colleagues to formally vote on the military effort. It’s dangerous out there. US trained and Saudi funded Wahhabi terrorists are lurking in the shadows, according to John Kelly, Trump’s boss over at the Department of Homeland Security and the former commander of United States Southern Command. “I was telling [Fox host] Steve [Doocy] on the way in here, if he knew what I knew about terrorism, he’d never leave the house in the morning,” Kelly said on “Fox & Friends,” according to The Hill. Philippine President Rodrigo Duterte said on Wednesday he wouldn’t rule out placing the entire country under martial law if the threat of Islamic State spreads. US President Donald Trump has said he is “more determined than ever” to pursue peace in the world after meeting Pope Francis at the Vatican. The two men have in the past clashed on issues such as migration, climate change and a Mexico-US wall. Mr Trump is now in Brussels for talks with Nato and EU officials. He will also hold meetings with Belgium’s King Philippe and Prime Minister Charles Michel. After the meeting between President Trump and the Pope, the Vatican said there had been an “exchange of views” on international issues. The US leader began his foreign trip with a two-day stop in Saudi Arabia over the weekend, urging Muslim countries to take the lead in combating radicalisation. Mr Trump and his entourage arrived at the Vatican just before 08:30, in a meeting that was arranged at the last minute. The US president was greeted by Archbishop Georg Ganswein, the head of the papal household, and escorted by the Swiss Guard to the offices of Pope Francis. 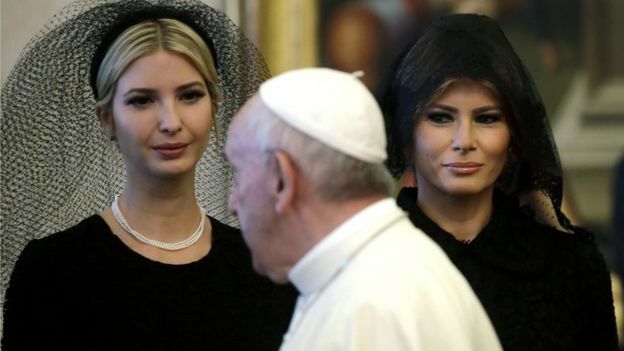 Correspondents say Mr Trump seemed subdued during their initial meeting, while Pope Francis was not as jovial as he sometimes is with world leaders. After the meeting, they exchanged gifts. Mr Trump gave the Pope a boxed set of writings by the civil rights leader Martin Luther King. He also presented him with a small sculptured olive tree, telling Mr Trump through an interpreter: “It is my desire that you become an olive tree to construct peace”. Mr Trump responded by saying: “We can use some peace.” He also said he would read the texts the Pope gave him. Mr Trump also met Italy’s president and prime minister while in Rome. Ever so slowly and flanked by the Swiss Guard the leader of the world’s pre-eminent superpower walked through the Vatican to meet the leader of one of the world’s pre-eminent religions. And were there ever two more different people? Pope Francis with just the merest hint of a smile; President Trump beaming. They sat across from each other in the pontiff’s study as though one was going for a job interview. During the election campaign, when Pope Francis visited the US-Mexico border he said that people who choose to build walls and not bridges weren’t Christian. Donald Trump said those comments were disgraceful. The normal mantra when two world leaders meet is to say “there is more that unites us than divides us”. Almost certainly true. But there are real differences as well. Mr Trump was joined not only by his wife, daughter and son-in-law but also Secretary of State Rex Tillerson and National Security Adviser HR McMaster. In a light-hearted exchange, Pope Francis asked her what she gave her husband to eat. It was initially thought he had suggested “pizza” to her, but in fact he said potica, which is a cake from Mrs Trump’s home country of Slovenia. She laughed in response, and agreed with him. What next for Mr Trump’s trip? This is Mr Trump’s first visit to Europe since taking office in January. Security has been stepped up across Rome, with the areas around the Vatican City, the Italian presidential palace and the American ambassador’s residence, where Mr Trump is staying, temporarily closed to traffic. Despite the heavy police presence, about 100 anti-Trump protesters held a rally in one of Rome’s squares on Tuesday evening. Significant protests are also expected in Brussels where he will meet EU and Nato officials. This visit will be about damage limitation with the fervent hope of establishing some kind of transatlantic chemistry, the BBC’s Europe editor Katya Adler says. She adds that the tone in Brussels has gone from off-the-record sneering when the erratic and unpredictable Mr Trump first won the November elections, to outright concern now that the implications of his presidency have begun to sink in.